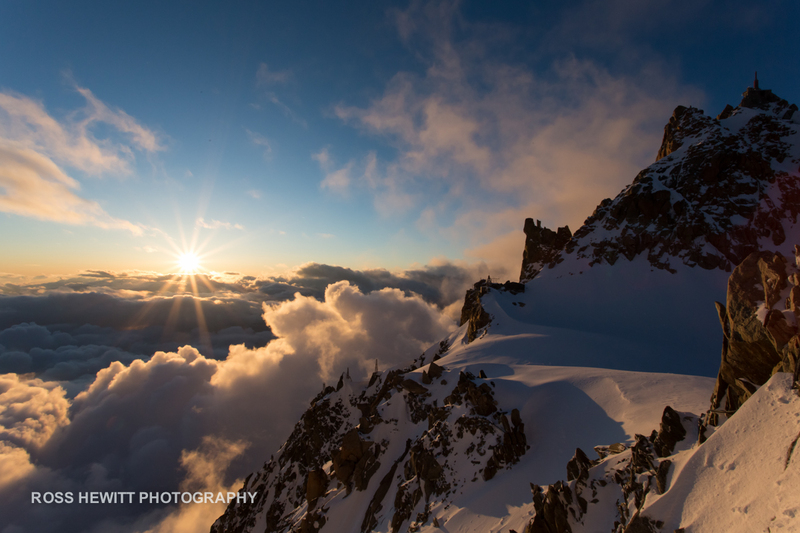 I took the last lift up that evening to the Aiguille du Midi in order to join the others at the Cosmiques refuge, my pack laden with five litres of water. The weather had not broken all day with heavy cloud coming and going, and I slid forward onto the arête only to be enveloped in thick fog. 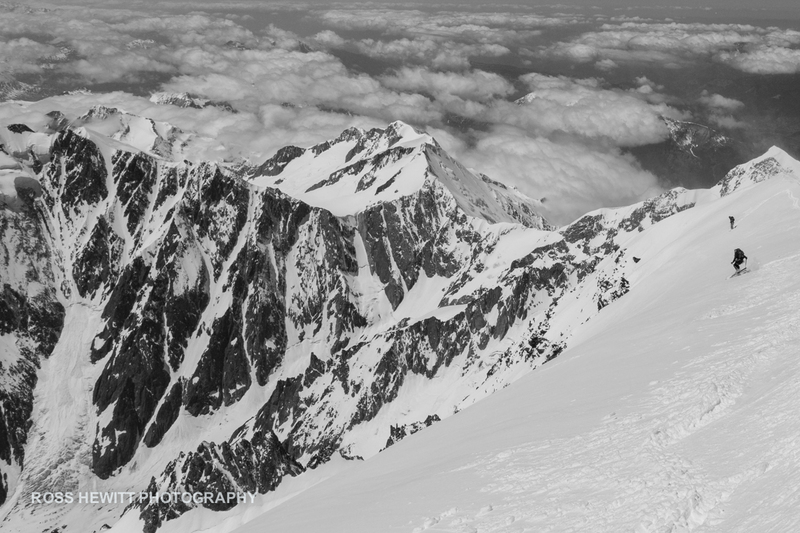 There was over 30cm of new snow on the arête, too much for our west face plan. It felt more like winter than spring. I stood patiently, waiting for it to clear, but soon grew cold and resigned myself to waking down the arête. 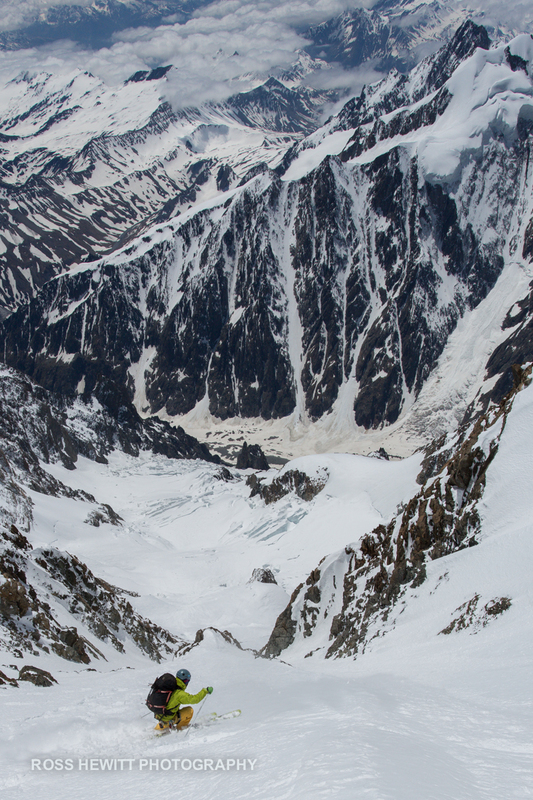 Where it levelled I skied down the south face, hugging the buttress and using the Midi as a handrail. There was only 10cm of new snow here so, if the sky cleared as promised, we were back in the game! Like a sign to us, just before we retired to bed the cloud dropped and we were treated to a majestic sunset above the inversion. It also enabled us to check the Tacul for any large accumulations. We enjoyed its warm glow, then turned in early to get some sleep before what we knew would be a very long day. When the alarm ripped me from my cosy sleep, I looked out of the window to see the stars glistening in the night sky and excitement grew inside me. We each went through our final preparations in silence, eating and drinking as much as possible before making our way out into the frozen, predawn air. For the next few hours we just needed to keep to time, eating and drinking on the move and avoiding unnecessary stops. As we skinned up Tacul the temperature continued to plummet and the frigid wind increased in strength. The whole place felt thoroughly hostile. On Col Maudit the wind was driving snow and we stopping to put all our clothes and suffered in silence trying to keep the extremities from freezing. The cold was in my core making me pee a lot and lose fluids, we were all cold and there was nothing to say or do keeping going. By now my skins were falling off regularly and we weren’t setting any records between stops to rewarm fingers and toes and to reseat skins. After climbing the Col du Mont Maudit in boot deep snow we kept walking as the wind had scoured the slopes slopes to Mont Blanc. On the summit it was a relief to drop down the Italian side a few metres and get out of that north wind. Below us the west face fell out of sight in vast, featureless snow slopes. 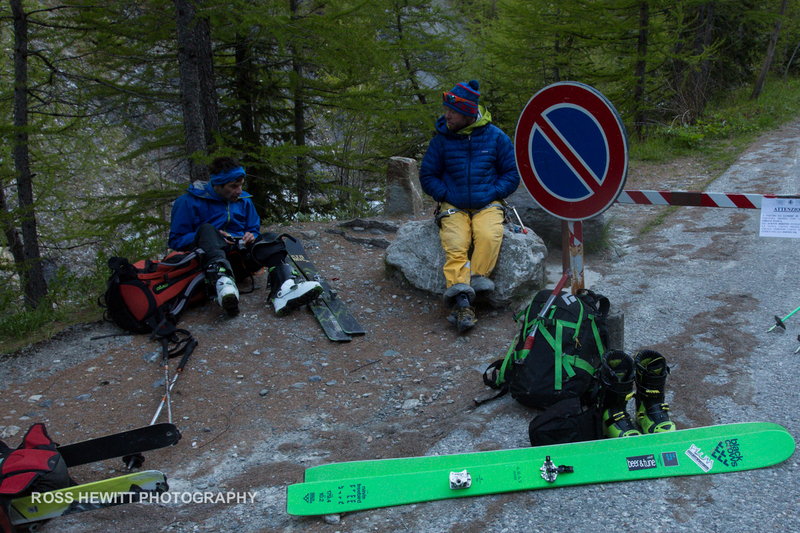 It would be easy to head off on the wrong line here and we knew there was only one skiable line in condition. Normally I’d strip off some layers to ski, but I was so cold now that I only swapped mitts for gloves – just to be able to handle my camera better. I put in the first turn on the relatively flat upper slopes. As the skis punched through the light crust the edges started to bite and squirm. Beneath the crust, and above the glacial ice, was a thin layer of sugar that meant we were unable to read where the ice lay. It made for tense skiing. I watched as others tested the snow below them with their poles, traversing back and forth and finding a safe passage through this zone. These are ‘fall-you-die’ lines and there is no margin for error. The tension tightened in my chest and I forced myself to stay calm, breathed deeply, and made each turn count. After 100m we were past the death ice section and onto good snow alongside a buttress. Below it we skied a long, enjoyable pitch on what must be the highest spine in Europe. We were all working hard – race-pace hard, where you smell the blood in your nose – trying to keep to time, knowing that was the only way to negotiate safe passage through the glaciers below. A short traverse took us into the south-facing Saudan line, a 50 degree couloir that fell away below us for over a thousand metres. Now the exposure had eased, we could relax a little. We enjoyed good, consistent snow all the way down to the lower apron. We had by now recovered from the cold and took some time to strip off shells and down jackets in preparation for the coming descent. The hanging seracs left of the Benedetti line were very active and as our route through the lower the slabs was right beneath this shooting gallery, we picked up the pace to exit the face over the final bergschrund. 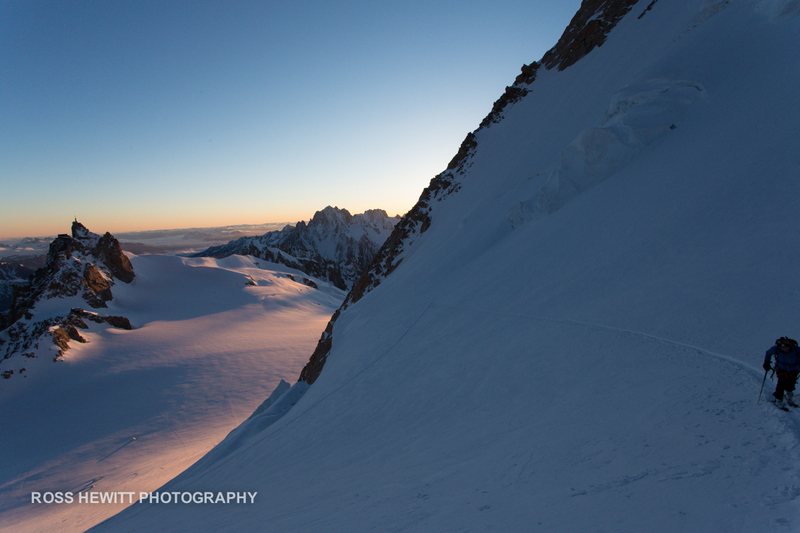 I needed to ski swiftly to limit the exposure time, but serac debris slowed us all right down. This old game of Russian Roulette beneath seracs tightened the tension across my chest again. Finally we cleared the face and relaxed. On paper the principal technical difficulties were over, but we still expected some combat in order to make it down to the Miage. 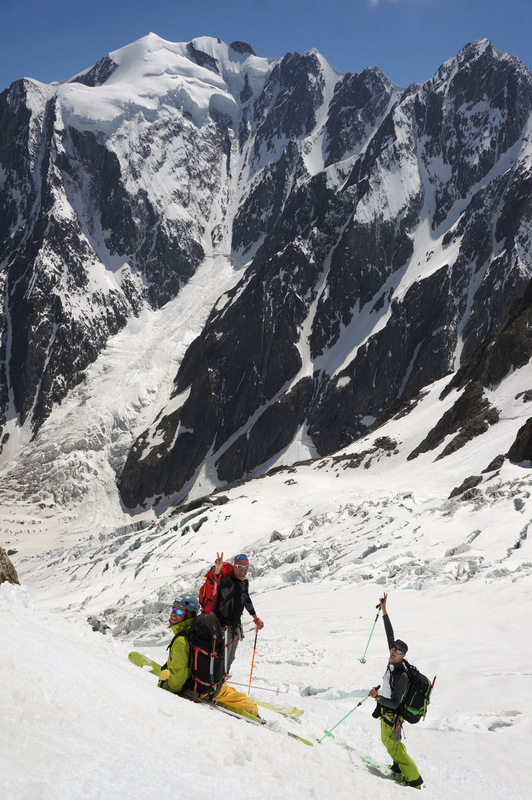 Glacial recession has made it difficult to negotiate the Mont Blanc Glacier to the Miage Glacier so our chosen escape route was to skin to the shoulder above the Quintino Sella hut and then ski the west-facing couloir down to the Dome Glacier. 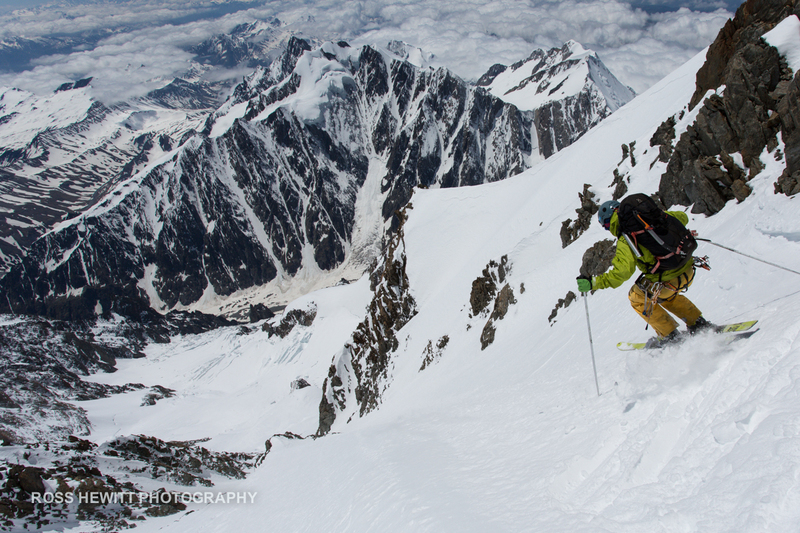 Our timing was perfect and the couloir skied so well we covered the distance in scant minutes. The Dome Glacier had been a big question in our minds but after roping up it only took a few minutes to cross and the weight of uncertainty was lifted, a few hours of effort would get us to the road. During the final walk we were spread out, allowing us to reflect on the day and think about some of the moments we hadn’t had time to digest properly in the heat of the action. Without doubt, it had been one of the most intense days I’d spent in the mountains – incredible situations and high quality skiing. After being in the world of snow, ice and rock all day long, the lush green alpage near Chalet Miage appeared particularly vivid and beautiful. 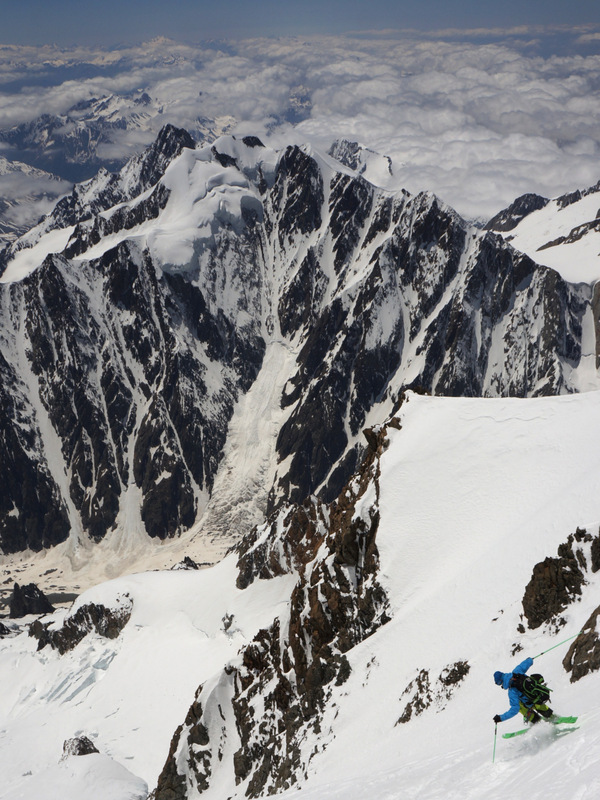 This entry was posted in Climbing, Landscape, Lifestyle, Skiing and tagged Aiguille du Midi, Aosta, スキー, パウダースノー, フリーライド, beau, Black Crows, chalet miage, Chamonix, Chamonix conditions, Chamonix Mont Blanc, Courmayeur, 粉, dome glacier, вне трасс, катание на лыжах, порошок, 雪, Freeride, Freeride Skiing, Gebirge, Gnarly, gonella, guilhem martin saint leon, Hors Piste, jesper petersson, Miage Glacier, Michelle Blaydon, Mikko Heimonen, mont blanc, Mont Blanc du Tacul, mont blanc glacier, mont maudit, montañas, Montagne, monte bianco, Mountains, neige, neve, nieve, снег, Offpiste, Offpiste skiing, parete ovest, PLUM, polvere, Poudreuse, Pow, Pulverschnee, quintino sella, rad, Ross Hewitt, saudan route, Skiing, snow, sylvain saudan, val veni, voir saudan, West Face, 关闭滑雪道, 山, 山スキー, 滑雪 by Ross Hewitt - Skiing, Climbing, Photography. Bookmark the permalink.